The best options for feeding birds in a particular location depend on both the season and the habitat. These determine which bird species are most likely to be in the area and, therefore, which foods would be most effective in attracting them. Nyjer (thistle) seed attracts a variety of Finch species; a special feeder is required, since nyjer seeds are very tiny. Suet attracts Woodpeckers, Nuthatches, and Chickadees. 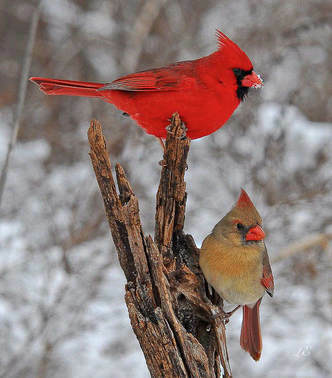 Other foods which often bring birds to feeders include safflower seed (a favorite of Northern Cardinals), cracked and whole corn, and whole peanuts. Use only unsalted peanuts. Do not use peanuts in the shell if you value your lawn. Squirrels like to bury them, and then dig them up later. It is easy to make homemade treats by adding seeds, peanut bits, and raisins to peanut butter (a favorite of a great variety of birds) or to melted suet. While commercial seed blends can be effective, less expensive blends often have substantial filler that birds don’t eat. You get what you pay for. Make your own seed blend using black-oil sunflower seeds along with some combination of safflower seeds, white millet, cracked corn, and peanut hearts. This results in a blend with no filler. These are general suggestions meant to provide a starting point for feeding birds. Give them a try, and go with what works best for your location. The OBI stories section consists of a variety of articles and posts all relating to environmental conservation.